By this time of year, our shelves are well-stocked with jam. We’ve been making it all summer: Strawberry, raspberry, blueberry. Rhubarb, cherry, three kinds of plum. We eat plenty of jam–on yogurt and oatmeal, in sandwiches, with fancy cheese–and still, we will make it through the winter. We have plenty of jam. But it’s hard to stop. And really, can there be too much jam? Extra jars make welcome gifts, and I never seem to find myself with much left over when summer rolls around again. So I was happy to spend a day in the kitchen with a box of organic peaches last week. They arrived on my doorstep courtesy of the Washington State Fruit Commission (full dislosure: the peaches were given to me at no charge, but the opinion that peaches are great is entirely my own). We ate one after another after another. And then it was time to make more jam. I asked you for your peach preserving ideas. I browsed the Sweet Preservation website. I flipped through Mes Confitures. I couldn’t decide. So I made some of everything. I made a sweet, chunky peach jam with a vanilla bean scraped in. I made a tangy peach chutney with a lot of grated fresh ginger. And, at Hannah’s suggestion, I made this Saffron Peach Jam. It’s based on a recipe from The Preservation Kitchen, but it’s a good deal sweeter than the version in the book. Some people say that saffron tastes spicy, or purfumey, or that it tastes like the sea. Here it simply provides an earthy, savory counterpoint to the sweetness of the peaches, subtle enough that my six year old loved the jam but intriguing enough that I have gone about my days plotting uses for it. I’m going to spoon it onto rice pudding and ricotta-topped toast. I’m going to layer it into my next frittata sandwich in place of the tomato jam. I’m going to serve it on a cheese plate. But meanwhile, it’s just been going straight on toast. Saffron Peach Jam (adapted from The Preservation Kitchen): Halve 4 1/2 lbs. peaches (8-9 large) and remove the pits. Place peaches in a large, heavy-bottomed pot with 5 1/2 c. sugar, 2 Tbsp. lemon juice, and 1 1/2 grams saffron (about a well-packed Tbsp.). Bring to a boil and stir until the peaches release their juice (10-15 minutes). Remove from heat, transfer to a covered storage container, and refrigerate overnight. Run the peaches and their juice through the coarse disc of a food mill, returning the resulting pulp to your large, heavy-bottomed pot. Bring to a boil and continue to cook at a low boil for 15 minutes, stirring often, until the mixture thickens somewhat. Fill sterilized jars and process in a boiling water canner for 10 minutes. Disclosure: I received a box of peaches at no charge from the Washington State Fruit Commission as part of their “Canbassador” program. I was not compensated for writing this post. 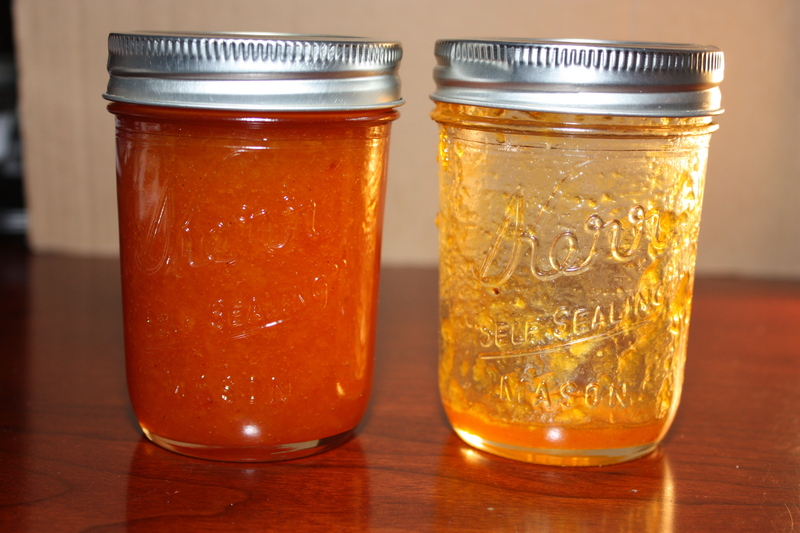 You can learn more about canning and find many more recipes on the Washington State Fruit Commission’s Sweet Preservation website. And aren’t these jar labels cute? This entry was posted in Food, Fruit, Preserving, Recipes, Vegan or Would-Be-Just-As-Good-Vegan and tagged canning, CSA recipes, jam, peaches, saffron, summer recipes on September 29, 2012 by emmycooks. Love the photo of the peaches and saffron. And the jam sounds so good! I agree! I can almost taste the sweetness in my mouth when I look at the photos. And I love harvest time – brings back great memories!!! flavor synergy, transcontinental style! just made a peach and saffron fruit leather! so this sounds delish to me. I need that. Do you think I could mix applesauce and jam to make fruit leather? My shelves are overflowing with both. I’ve never made fruit leather but a friend recently loaned me a dehydrator and I’ve been getting crazy with it. I think I’m ready. Please advise about the applesauce-jam shortcut strategy? Beautiful photo of the peaches and saffron! The next time I make this, I’ll do the overnight macerating…I was impatient and didn’t plan ahead. Isn’t Preservation Kitchen amazing? I can’t wait to try the butternut squash aigre-doux…I’m already planning Thanksgiving. Delighted you like the peach saffron jam recipe! Wonderful. I have just been given a bag of beautiful white peaches from the orchard of friend. If I don’t eat them first, I might make jam. I hope you ate them first. That is, of course, their highest calling. Although if you made jam, you could open a jar next month, and that’s not bad either. That looks SO GOOD! I haven’t done anything with peaches this year, and probably won’t have time. This needs to be on my list for next year! I’m glad to know that I’m not alone in keeping a list for next year. It may seem premature, but I’m already looking forward to next summer’s stone fruit! I’m a huge fan of both saffron and peaches (especially peaches from Palisade, CO) and the two mingled in a jam sounds delicious! I love how you’ve plotted using it -wish I had some now. I’m glad that you have good local peaches too. That’s a lucky break in life! :) What are your favorite saffron uses? I don’t use it much but have been on a bit of a saffron kick lately and would love some new ideas! It is a lot of saffron! The flavor is intense, and I thought a fun way to experience it (since it’s usually relegated to a background flavor). I worried at first that the big quantity of saffron made it unreasonable to post because of the cost, but then I realized that even after the saffron you come out ahead vs. buying jam in the store, especially a fancy one! This sounds so wonderful! I’m sure the saffron adds that special something. 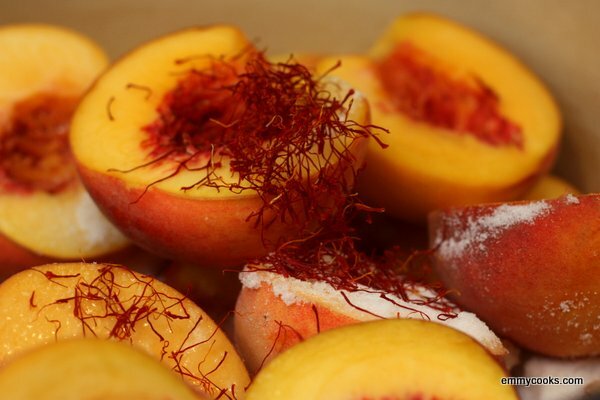 Peaches and saffron sounds really cool together – I’m more used to saffron in savory dishes but I’m really excited to try this out. I might adapt this to a pie filling since I don’t have a food mill. I’ve made just about everything out of peaches….ketchup, BBQ sauce, jams, fruit leather, chutney, etc., but I NEVER thought to pair it with saffron until seeing your tweet this morning. Thanks for the inspiration! Lovely photo of the peaches and saffron threads, Emmy. And the jam sounds really interesting (in a good way!). I hadn’t seen that, but it’s great. You know, when I wrote that, I really meant interesting in a good way but afterwards thought, oh no, she may think I meant it in the bad way! But it was too late!